The top salary for an employee in Michigan state government in 2017 was $377,137, according to the Michigan Civil Service Commission. That salary, which doesn't include the cost of benefits, was earned by Jon Braeutigam, the top investment officer for the Department of Treasury’s Central Payroll Agency, which handles the investments of the state’s employee retirement funds. The next three highest salaries – $329,600, $254,705 and $254,700 – were also earned by Central Payroll employees. 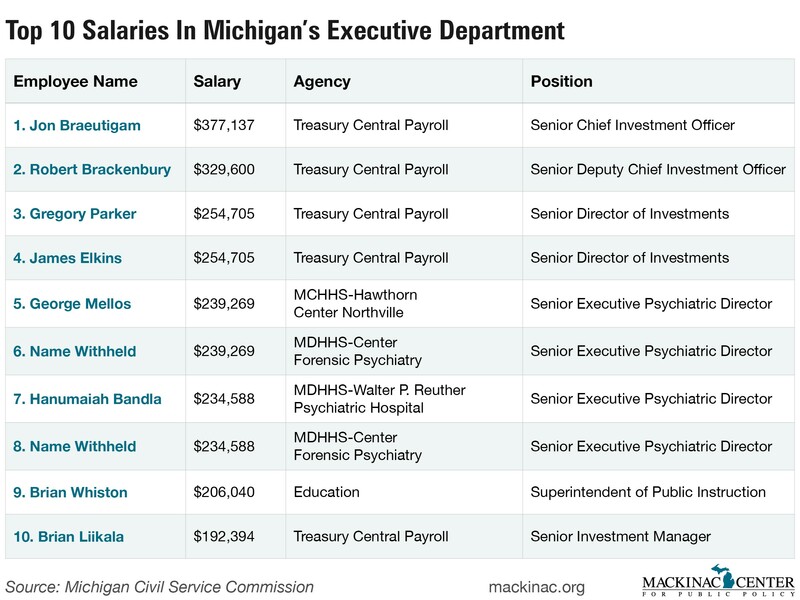 The fifth-, sixth-, seventh- and eighth-highest salaries were earned by senior executive psychiatric directors in the Michigan Department of Health and Human Services. Those four salaries ranged from $239,269 to $234,588 this year. For reasons of personal safety, state documents don’t include the names of two of the psychiatric directors. The ninth-highest salary was earned by the state’s public school superintendent, Brian Whiston, at $206,040 a year. The tenth-highest salary was earned by the senior investment manager of the payroll agency, Brian Liikala. According to state records, the 100th-highest salary for state employees in Michigan was $165,000 in 2017. Some other state employees earning a top-100 salary include the director of the Michigan Department of Health and Human Services, Nick Lyon, at $175,000, State Treasurer Nick Khouri at $174,204 and State Police Chief Kriste Etue at $165,000. The governor’s salary is set at $159,300. See what most Michigan public employees earn at www.MichiganGovernmentSalaries.com.